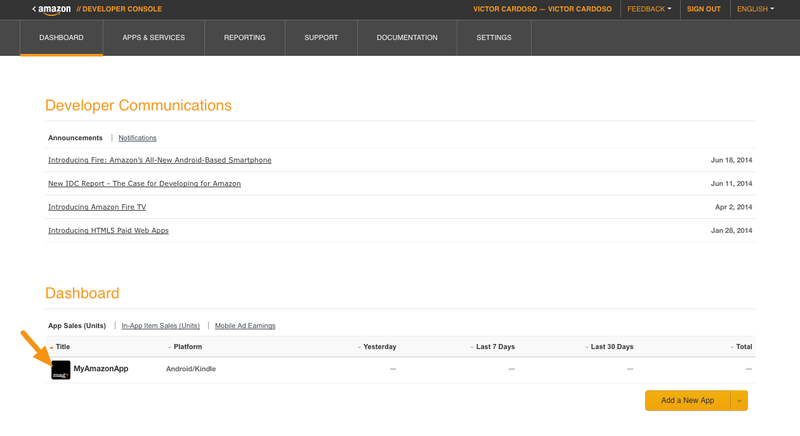 In order to offer subscriptions to content in your Kindle Fire app, you must create in-app items in the Amazon Developer Console which you will connect to Subscriptions you create in the Mag+ Publish portal. 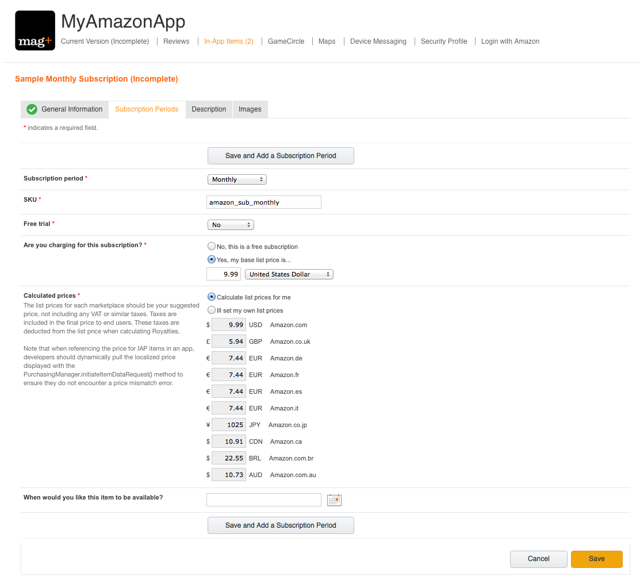 This article will show you how to create an in-app subscription in the Amazon Developer Console and how to connect it to a Subscription in the Mag+ Publish portal. Subscriptions in the Amazon App Store work differently than subscriptions in Google Play, even though both are on the Android Platform. Amazon subscriptions are similar to Apple App Store subscriptions. When an end user signs up for an Amazon subscription, they will get access to all content that is published after their subscription start date. When they cancel their subscription, they will still retain the ability to download content that was available during their subscription period. Make sure you have signed up as an Amazon developer. For more information, read the article "Kindle Fire - Set-up Your Amazon Developer Account." You should have at least one app created in the Amazon Developer Console. For more information, read the article "Kindle Fire - Creating an App in the Amazon Developer Console." If you will be charging for your subscriptions, be sure to complete the payment information fields in the Amazon Developer Console under Settings > Payment Information. In addition to the Payment Information fields, you will need to complete Amazon's Tax Interview questions if you will be charging for your subscriptions. You can find the questions in the Amazon Developer Console under Settings > Tax Identity. 1. Log in to your Amazon Developer Console <https://developer.amazon.com/home.html> and click on the app that will offer the subscriptions. 2. Click on the tab labeled "In-App Items." 3. Click on the button labeled "Add a Subscription." 4. Enter the subscription details and click "Save." SKU: The SKU is a 150 character string which cannot be empty and can contain the characters a-z, A-Z, 0-9, underscores, periods, and dashes. Mag+ recommends using a base subscription SKU such as magplus_amazon_sub. Content Delivery: Content Delivery should be set to "I'll deliver the required asset(s)." Note: Copy the SKU you enter here to a text document. You will use this ID in the "Amazon Market product SKU" field in the Mag+ Publish portal. 5. Click on the tab labeled "Subscription Periods," enter the requested information, and click "Save." Subscription Period: This indicates how frequently the user will be charged the base list price. This charge automatically renews until the user cancels their subscription. SKU: mag+ recommends using an addendum to the SKU used in the previous screen. If the general subscription SKU is "magplus_amazon_sub" then the SKU for this subscription period would be "amazon_sub_monthly." Free Trial Period: While optional, a free trial period is useful to give your readers a taste of the type of content you will provide. Are You Charging for this Subscription: If choosing "Yes," set the base price and allow Amazon to calculate the list prices for the other Amazon regions. Note: Copy the SKU you enter here to the same text document used in the step above. You will use this ID in the "Subscription Period SKU" field in the Mag+ Publish portal. 6. Click on the tab labeled "Description," entered the requested information, and click on "Save." Readers will gain access to all newly published content as a part of the subscription. How frequently you plan to distribute new content (eg "New issues distributed monthly"). How frequently the reader's subscription will auto-renew (eg "Subscription will auto-renew on a monthly basis"). 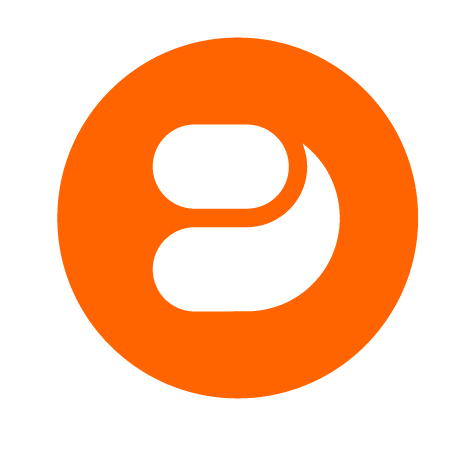 Readers will retain access to any content published during their subscription period if they decide to cancel. 7. Click on the tab labeled "Images," upload the requested assets, and click on "Save." 8. With all tabs showing a green circle with a check, click on the button "Submit In-App Item." 9. Go to the Mag+ Publish portal and associate the two SKUs you entered above with a Mag+ Subscription. 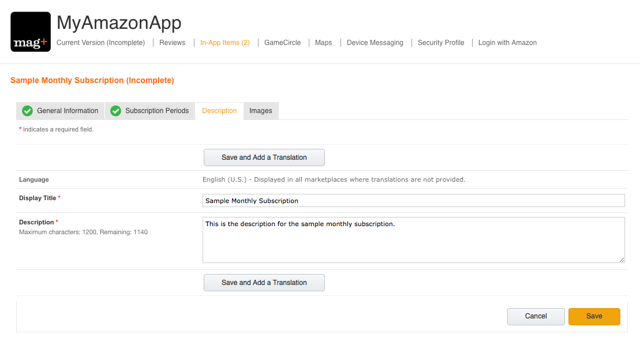 Note: For more information, read the article "General - Adding and Managing In-app Subscriptions." There are additional steps to complete before you publish your app. You must create content to include within the app, customize the app's look and feel to match your brand, and then you must build your app and upload it to the Amazon Developer Console. For more information on these items, please look at the other articles in our knowledge base.